It was a great day for running this morning and it meant to run a new personal best for (almost) every racer in Pike’s Peek 10K. I raise dark and early, gave myself lots of time to have breakfast and coffee, and do other stuff before get my rear to Shady Grove station. I get to the starting area around 6:30 and barely anyone there; it was a hell lot different to my 2010’s race. I remember I woke up at 07:00 and known that I was going to be late to the race and got myself out of the door less than 10 minutes. Anyway, I got there and met up the guys, greet with new GRC gals; then start the warm up with everyone. I ran about 25 ~ 30 minutes with everyone and have few more minutes on my own. For the total of 45-nish minute light jog as warm up, roughly around 4 miles. I got my bag from the car, change into racing shirt and short, and checked it in. As everyone thought the race going to start sharply at 7:50, BUT, no… for whatever reason, the race didn’t start till 8:05 or so. Clocked 36:55 – official result is 36:52, averaging 5:56 per mile. It is a 2:07 faster than last year on the exact same course. By running this new personal best, I am well qualified as a sub-seeded runner in Bay to Breaker 12K in San Fran; but I am not going to run it this year, most likely will run that in 2012. What now? Now is time for rest up for New Jersey Marathon on May 1. If I do it right and not being a damn fool to run another personal best on a training run, then I think I can run a 2:58 ~ 2:62 marathon. I’ll see. Since I am tapering for marathon, I can’t drink alcohol for three week, Master A’s order. So I didn’t reward myself by drunken myself. I went to local nursery and award myself with a Pineapple Pear tree. I put in the ground with my bare hands and hopefully it can produce fruit in two to three years, if it doesn’t die next month. I’ll see about that. I have two thoughts today about running. First, while I was having breakfast, I finish reading the last few pages of Born to Run, and I think I will move my distance up a small little notch – 50K. 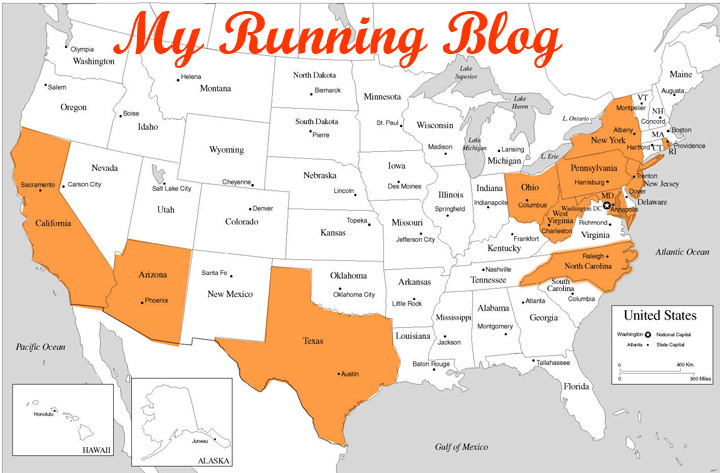 This is not really because the book and it is not totally because I saw Ms. O’Neal in Stone 50Miler; it is really because in I can more choices to run races in different state to complete my 50-state goal and I think the calling of the universe on its way. I foresee myself doing this some time 2013/2014/2015. Second, within the last twenty-four hours, several different people ask/suggest me to train on track. I do not like run on track and I try everything to avoid running on track; but I do want to lower my miler time to 5-minute this year in MCRRC Midsummer Night's Mile. I think I can get away from track by doing more extensive tempo run, but I understand the best way to train my legs to run in such pace would be train on the track. Here is an idea, if someone helps me train without get on the track; I will home brew you a nice bottle of Sake. Anyone? Anyway, I will be off/easy day tomorrow and run easy on Tuesday, then will see how I feel later.